Downpours associated with thunderstorms that moved over Jackson Hole on Sunday produced about a half an inch of rain in town. That actually put us over the top for July’s precipitation and we are now above normal for the month, with another week or so to go. Normal precipitation in town in July is 1.05 inches and so far this month we have received 1.23 inches. That goes a long way towards making up the deficit we have been in, and we are still below where we should be for the year so far, by a little over an inch of water (-1.13 inches). Especially after below normal rainfall in May & June. Looking at our total precipitation to date for the year (through July 22, 2012), we now stand at 8.21 inches of water. Historic average would be 9.34 inches for January through July. Back in 1988, the year of the Yellowstone Fires, we only had 6.99 inches for the year, through the end of July. Looking back through the last 10 years or so, I found three other years that we had even less precipitation than what we had in 1988, between January 1 and July 31. They were 2001, 2003 and 2007. Another thing to consider is that we just had three years in a row with above normal for precip at this point in the year. See table below. 2012 so far = 8.21 in. Historic Average Jan.-July = 9.34 in. Data in this table is taken from the Jackson Automated rain gauge, for comparison. These current numbers are coming from an automated instrument near the site of the historic Jackson Climate Station, which was manually read by U.S. Forest Service employees up until February 2012, when they stopped taking manual readings. The historic numbers used for establishing our monthly averages were all read manually, for over 60 years. The thunderstorms went up the west side of the Tetons and directly over town Sunday did not distribute rainfall evenly in all locations. The automated rain gauge near the old Jackson Climate Station recorded 0.48 inches. The Town of Jackson gauge at the County building showed 0.50 inches. And the automated gauge at the Driggs, Idaho Airport showed 0.52 inches of water. Grand Teton National park gauges recorded only around 0.10 inches, and even all the way up to Old Faithful, just 0.13 inches. All much less than in town. 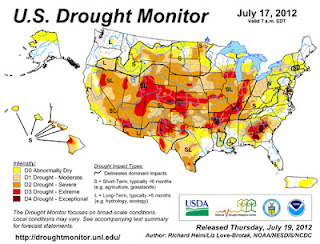 The current U.S. Drought Monitor Map shows that most of Wyoming is in a “moderate” to “extreme” drought, while Northwest Wyoming, including Teton County is “abnormally dry”. Areas of southern Wyoming, especially between Rock Springs & Rawlins have some of the worst conditions. See map below. In a relative sense, we aren’t so bad off here in Northwest Wyoming, all one has to do is look around and we still have some pretty green hillsides. Not too many other places in Wyoming have that going for them right now.